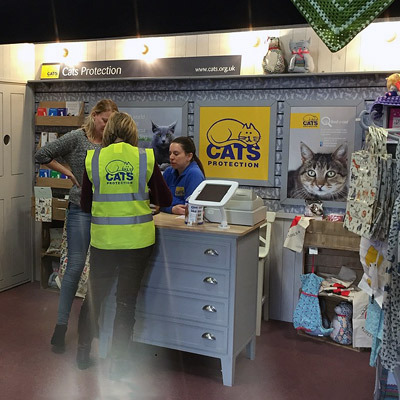 Cats Protection attends a variety of large lifestyle shows, both indoor and outdoor, to raise awareness of and encourage support for the charity and its many activities. Our attractive merchandise and graphics display act as a magnet for cat lovers at the shows! Our friendly, trained staff use digital and screen technology and literature to engage with visitors and communicate about a wide variety of issues including, for example, cats and their care, volunteering opportunities and adopting a CP cat. We also help to promote local activities such as open days, regional neutering programmes and homing centre openings, and encourage visitors to get involved with our advocacy campaigns and events, such as the True Cost of Kittens and the National Cat Awards.